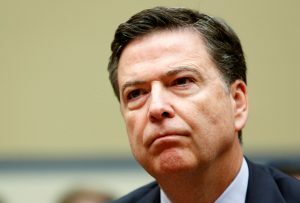 WASHINGTON — The Republican National Committee says President Donald Trump knew that firing FBI Director James Comey would be “detrimental to his presidency” but believed it was the right thing to do for the country. That’s among the talking points the RNC is providing to Trump backers ahead of Comey’s testimony on Capitol Hill Thursday. A pair of former White House officials — Katie Walsh, who left her post as deputy chief of staff in March, and Mike Dubke, who stepped down as communications director last week — are helping the RNC effort to combat Comey’s testimony. The RNC is encouraging supporters to focus on Comey’s acknowledgement in his prepared text that he told Trump he was not directly under investigation as part of the FBI’s Russia probe. Republicans also say the president does want the Russia investigations to move forward, an argument the White House has used against Democrats who say Trump fired Comey in an effort to halt the FBI probe.